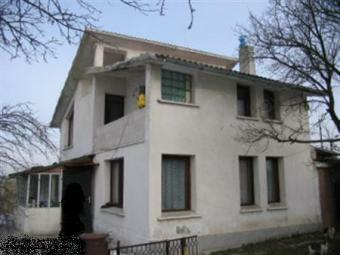 Description: Cozy Bulgarian holiday home with garage located in a well served village. There is convenient bus transport to Varna town. The village is accessible all year round, and benefits from all facilities that the closeness to a big city can provide. There is big dam nearby with excellent opportunity for fishing. The house is located in an ecologically clean area and offers beautiful countryside views. The house is massive and built out of bricks. The house offers 100 sq.m of accommodation and comprises as follows: On the first floor is situated kitchen, living room and bedroom. The second floor consists of 2 bedrooms, a bathroom with WC and a bath- tube and a terrace. There is attic space with a terrace. Garage and additional parking space are available too. There is enough space for some kinds of sports facilities, a kid corner, a barbecue area, a garage and why not a swimming pool. The house has a new roof tiles and needs just some cosmetic renovation work. The massive village house borders an asphalted road and is enclosed with a fence. The place will charm you with its wonderful nature, amazing views, fresh air and tranquility. The property is in a ideal position for the beaches and the airport at Varna and makes a great future investment!